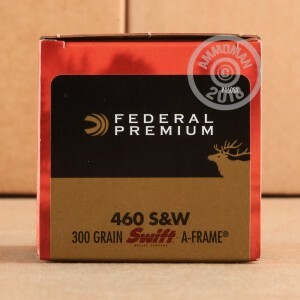 This .460 S&W ammunition from Federal's Vital-Shok series is a powerful hunting load designed to take down midsize game at relatively close range. 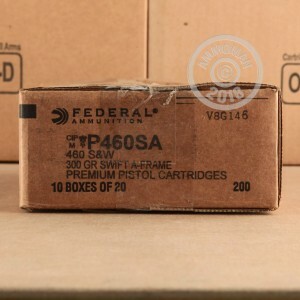 Each cartridge in this box of 20 fires a heavy 300 grain Swift A-Frame soft point bullet at a muzzle velocity of 1,750 feet per second. The Swift A-Frame has a dual core design with a heavy base that pushes the soft tip outwards into a high diameter mushroom. 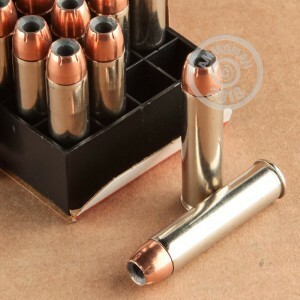 This ammo is loaded in Anoka, Minnesota and uses non-corrosive Boxer primers and brass cases. Place an order for $99 or more and get free shipping from AmmoMan.com. There's no hassle, no calculations or zones, and no code to redeem--simply place a qualifying order.